After the death of Clarissa's father she finds her birth certificate in his desk, and reads it for the first time. Realising her father wasn't the man she thought he was, and as a byblow finding out her fiance hasn’t been entirely honest either, she travels to northern Finland, and then other parts of Lapland, in one hundred and thirty short, fraught and careful chapters. In reminiscence we learn about her emotionally distant mother, who disappeared without a word fourteen years before, and see a child desperate for her mother's love. Grown up, she's behaving the way her mother did: leaving her devoted fiance Pankaj without a word. Halfway in further discoveries and memories make the novel almost unbearably sad, and though the conclusion is heartbreaking, Clarissa sees it as a kind of success – making it sadder still. Although this novel from the editor of The Believer takes us to an ice palace of sorts, it isn’t a fantasy. Or rather, it’s not part of the fantasy genre: it’s about the fantasy of leaving everything behind, escaping oneself, all responsibilities and obligations, and beginning anew. 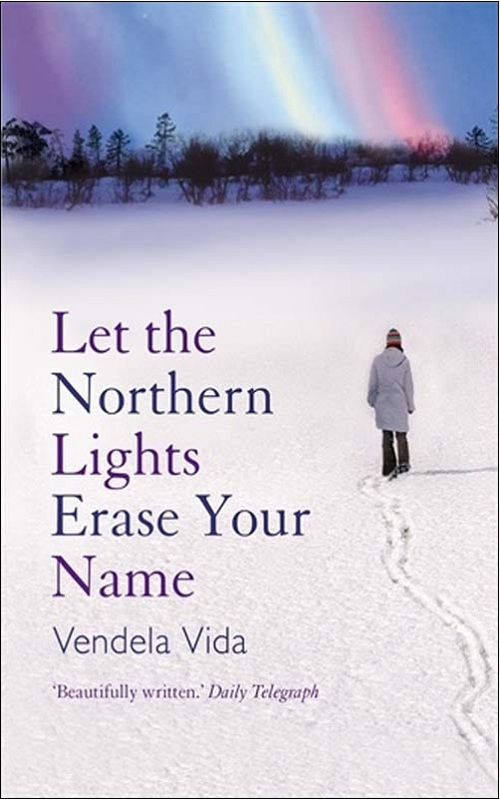 Vida explains in her afterword that she was “curious about the kind of person who would see their past as unconnected to their present”, and I read the novel as an attempt to imagine the psychology of someone who could make such a break successfully, if that’s the right word, although the first person narrator’s quiet pleasure in the quirks of those she meets is perhaps a little at odds with her behaviour. It pains me to agree with the Daily Telegraph, but, as they are quoted as saying on the cover, this is indeed “beautifully written”, and though it’s a book about someone who is recently bereaved and profoundly unhappy, it’s full of gentle humour, particularly in Clarissa’s interactions with the English-speaking people of northern Europe. 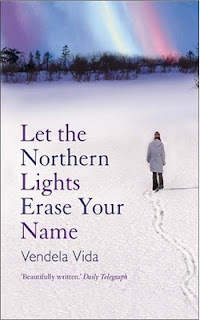 Let the Northern Lights Erase Your Name, by Vendela Vida. Atlantic Books, ebook, 2917ll. 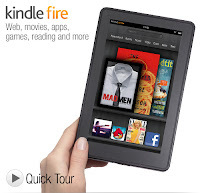 Bit disappointed that the new Kindle Fire isn't launching in the UK yet - although I imagine Amazon's recent investment in LoveFilm (and hence getting its hands on LoveFilm's streaming deals) means it'll be out here eventually. Although I love my iPad, it mainly gets used for reading, listening to music and the radio, idle browsing and playing the odd game. The only serious work I do on it is proofreading. I do all my writing on our Samsung Chromebook nowadays: it has a proper keyboard, for one thing, and doesn't get annoyed when I try to use Google Docs. The US is also getting the Kindle Touch, which has no keyboard, but does have speakers, and unlike the Kindle Fire still uses e-ink, which is great: I was worried by rumours that Amazon were planning to ditch e-ink screens altogether, and that would have been nuts. The iPad screen is great for reading comics or watching movies, but I wouldn't choose to read a long novel on one, and I imagine it'll be the same for the Kindle Fire. Bit worried by the touchscreen – the Sony Reader Touch was horrid – I spent more time cleaning the blasted thing than reading it – but I can't imagine Amazon would put out something quite that hopeless. All the UK is getting for now is the new, ultra-cheap Kindle, which lacks speakers (so no audiobooks) and lacks a keyboard. For most readers, the trade-off in weight and cost will probably be worth it. It's down to 6oz now, apparently, which is old-timey talk for... checks with Google ...170g. About the weight of a small 200pp paperback. I think it'd be a downgrade from the Kindle I've already got (which is now renamed the Kindle Keyboard) – I love being able to make annotations with the keyboard – so I won't be getting one, but I imagine it'll do very well for them, especially at £89. How Kevin Keller inspired me to come out of the closet... as an Archie fan! I have an admission to make. I’ve been keeping a secret. Over the last month or so, on the iPad, I've been reading a lot of Archie comics. Reading an issue of Archie at bedtime is a great way to clear my head of whatever horrors populate the latest book I’ve been reading. Plus, they’re cheap, back issues are plentiful, and they look fantastic on there. My favourite character is Jughead. He’s hilarious. The way he eats. The way he talks with his eyes closed. His daft cut-up fedora. The way he alone is aware that they are comic book characters. I was a bit embarrassed to mention my burgeoning love for Archie and his pals, given that they’re mainly for kids, and they have kind of an uncool reputation. At least that’s my impression of how they’re seen in the States - here in the UK I doubt many people have even heard of them, and when they have, it’ll usually be secondhand, via a reference in an American sitcom. But reading a couple of issues of Veronica this week, #207 and #208 (published in June and July this year), I was thoroughly impressed by the gang’s first openly gay character, Kevin Keller, and so I wanted to step out of the comics snob closet and give Archie – and writer/artist Dan Parent – some props. Kevin's sexuality was dealt with in a matter-of-fact way that I loved; he likes guys rather than girls, and that’s all there is to it. My wife and I take the same approach when we talk about these issues with our children. Some boys like girls, some boys like boys, that’s just the way it is. Why not just tell the kids that, rather than filling their head with nonsense? It's not like it's a big deal. Or rather, it shouldn't be. The cherry on the cake was that that Kevin gets to say “It gets better” to a little kid who is getting bullied. I’m kind of glad they took the approach of introducing a new character. If Jughead, who famously hates girls, suddenly came out of the closet, it would have made every bit of sense, but it would have brought the worst out of character conservatives. This way, if people want to complain about there being a gay character in the Archie gang (and I do hope he becomes a regular), they have to put their biases on display, rather than hiding them behind the uniform of a continuity cop. So if you have an iPad, and you want to see it at its very best, treat yourself to a couple of issues of Archie, Jughead, Betty or Veronica. 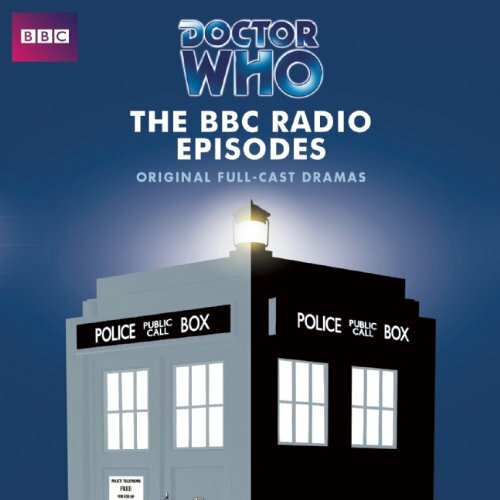 This audiobook begins with an explanation of how a history teacher and a science teacher came to be travelling through time and space with a grumpy old scientist and his fifteen-year-old granddaughter. Once listeners are up to date, we join the travellers as one by one they wake from unconsciousness, memories jumbled and lost, inside their time/space ship. Doors open and close, clocks melt, control panels give electric shocks. Before the mysteries can be solved the quartet must surmount their mutual distrust, but that won’t be easy. Ian and Barbara, the teachers, have been tricked by the Doctor before, on the planet Skaro, while young Susan explains that the Doctor too has been betrayed by friends in the past. There have been many moments in the Doctor’s long life of which he would be less than proud: running dalek experiments on Jamie, ditching Sarah Jane Smith, quipping while a man died in an acid vat, and multiple dalek genocides. But this story set a bar for bad behaviour that wouldn’t be raised until the sixth Doctor tried to strangle Perpugilliam Brown. The Doctor here is quite the mad scientist. In the Sartrean play of argument and recrimination he behaves abominably from start to finish, curtly dismissing sensible suggestions, lying, being very rude about humans, and even drugging Ian and Barbara at one point. At the end, even an apology to Barbara turns into a bit of a lecture. Nigel Robinson’s novelisation captures the eerie, fractious tone of the original episodes very well, and William Russell’s reading is, as with The Dalek Invasion of Earth audiobook, quite wonderful, his Doctor just as irascible as the narration describes him, his Ian, Barbara and Susan capturing their shifting moods. His introduction to CD3 is delightfully jaunty: “Disk threeee!” The music is well-judged, the soundtrack missing only a sprinkling of authentic Tardis sound effects. Overall, a sometimes gruelling but always gripping three-and-a-half hours for the listener. After all the theories and arguments, the solution when it comes is brilliantly bathetic. For Doctor Who fans this is an almost pure pleasure. 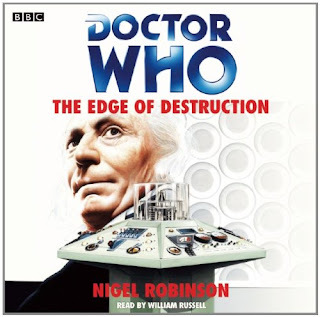 Doctor Who: The Edge of Destruction, by Nigel Robinson, read by William Russell. Audiogo, 4xCD, 3hr20. Amazon UK. Amazon US . This review originally appeared in BFS Journal #3. Five small children enter a deserted haunted house, but only four emerge. Years later, a grown up Yuki, the one they left behind, turns up at the door of blind Rin, and the friends gather to take her to hospital. 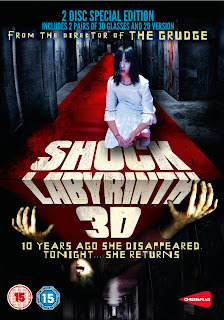 The hospital is deserted, time stands still, and they are back in the shock labyrinth – a huge ghost house – to be haunted by their guilty secrets. Scary for them, less so for the viewer; the film achieves its most alarming moments by putting young children in danger as the timelines (apparently) cross. Kids in trouble aside, it’s mainly four young adults wandering round a haunted house without much going on. The film tries to conceal this with flashbacks and flashforwards, but the core of the film is not terribly interesting. The 3D aspect does it no favours – the 3D version is a red-green mess, while the 2D version is full of embarrassing would-be 3D set-ups that puncture the film’s seriousness. Not a film I can recommend. Lordi’s Dark Floors, previously reviewed in these pages, is remarkably similar but much more fun. Coming from the director of The Grudge, this was a huge disappointment. 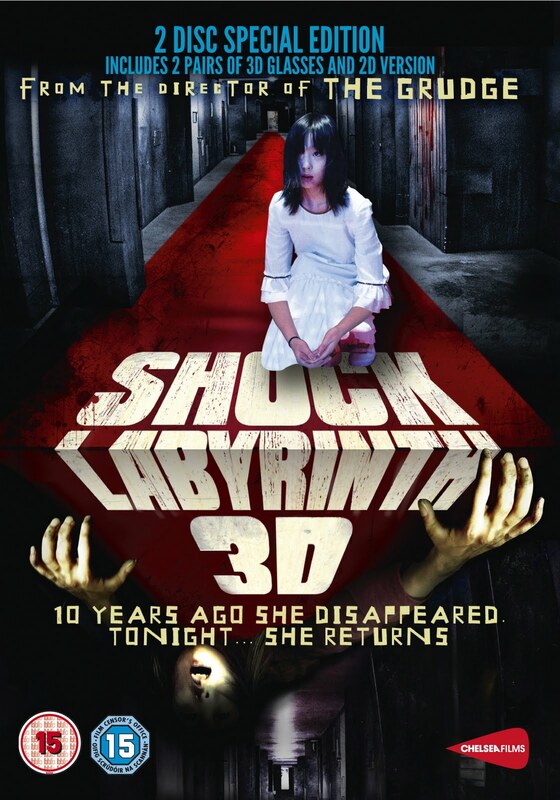 Shock Labyrinth 3D, Takashi Shimizu (dir.). Chelsea Films. Amazon UK. This review originally appeared in BFS Journal #3. The return of a beloved feature from our old website! I like listening to music while I work, but have tended to find PC music players too distracting (too much temptation to skip to a favourite track, or to another album, or to read their built-in music encyclopaedias...), so I rely on a five-CD changer stereo which I load up and leave to play. And every so often on our old website I used to run through the CDs that were currently at home in there. I’d like to review more music on the blog; one reason I don’t is because it’s so hard to choose the right moment in my relationship with an album. I considered many of my favourite albums washouts after the first time I heard them: Mogwai’s Go On Die Young, Tricky’s Maxinquaye, M83’s Dead Cities, Red Seas and Lost Ghosts, and so on. Having a regular round-up prompts me to write a bit about music without worrying about that too much. Since cancelling Spotify premium (it seemed silly to pay for it since I was only using it to listen to albums I already owned) I’ve been making an effort to buy a couple of new CDs each month with the money saved, so there’s more new stuff here than is normal. 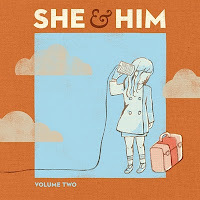 She & Him are Zooey Deschanel and M. Ward. She writes the songs and plays piano, he produces and plays guitar. I loved their first album, and this one’s just as good, if not a bit better. Sweet but smart. Here’s an example. I just adore her voice – if you haven’t heard either of these albums, perhaps you remember her singing Baby It’s Cold Outside with Will Ferrell in Elf? Her sitcom The New Girl is supposed to be very good; her geeky character apparently breaks into silly songs all the time. We're really looking forward to it. Probably going to review this one for the media section of the next BFS Journal, so I won’t say too much here. One of those albums that I like a little bit more than I want to, but not as much as I thought I might. I doubt it’ll last long in the five. I bought this after reading this Guardian article about them. 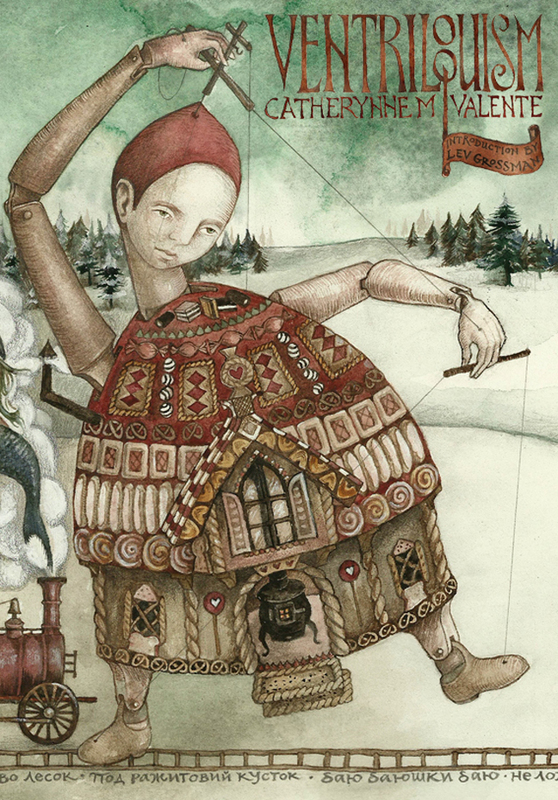 It’s techno music, essentially, quite similar to an instrumental Underworld, but played on traditional musical instruments rather than computers and synths. The description reminded me of one of my old favourites, Possessed, The Balanescu Quartet's superb album of Kraftwerk covers. You Make Me Real is definitely a good album, and makes a brilliant soundtrack to the working day, but too early yet to say whether it'll be a long-term favourite. It makes you want to go on a long train journey alone so that you can listen to it while staring mournfully out of the window. Track 2 Bop is quite typical and has an excellent video. Remixes of Daft Punk’s soundtrack by people like Moby, Photek and the Japanese Popstars. Have to admit, I bought this because I’ve lost the CD of the original soundtrack and it seemed silly to buy the same CD again. I hadn’t even ripped it to the PC! I’m sure it’ll turn up eventually (still got the case). There are a few tracks on here that I really love - M83’s take on Delta Fall, The Crystal Method’s The Grid, and Teddybears’ Adagio for Tron, for example - but after a strong start it tails off a bit. I saw Tron: Legacy for the first time this month on Sky and loved it, to the extent that I bought the Blu-ray the very next day. As a film maybe it’s flawed, but I reckon it’s the best music video of all time. In this Twilight Zonish thriller from first-time director Kaare Andrews a quintet of attractive young Canadians take a small plane up for a short hop to a campsite. Mechanical malfunctions and what's-your-malfunctions accumulate until they find themselves stuck on an upward trajectory, at each other's throats and pursued through a black storm by a tentacled monstrosity. Much like Pontypool, this movie does a lot with very little. Dialogue-driven, but not afraid to give us a really good look at the monster before it's all over, it's a very satisfying movie. Andrews is a comic artist, and has an artist's eye for the faces of his actors, holding firm in his study of them - even when there is snot dribbling out of their noses, unfortunately! Despite that, a really nice little movie. 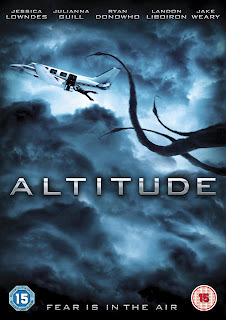 Altitude, Kaare Andrews (dir.). Amazon UK. Amazon US . This review originally appeared in BFS Journal #3. Although my collection of books is pretty big, there are gaps, even when it comes to my very favourite authors. Not for much longer! The SF Gateway plans to have 5,000 backlist titles back on sale as ebooks by the end of 2014 (press release here), and wherever possible they will be republishing the complete backlists of authors. Complete backlists! This isn't new news, but the significance of it is only just starting to strike me. 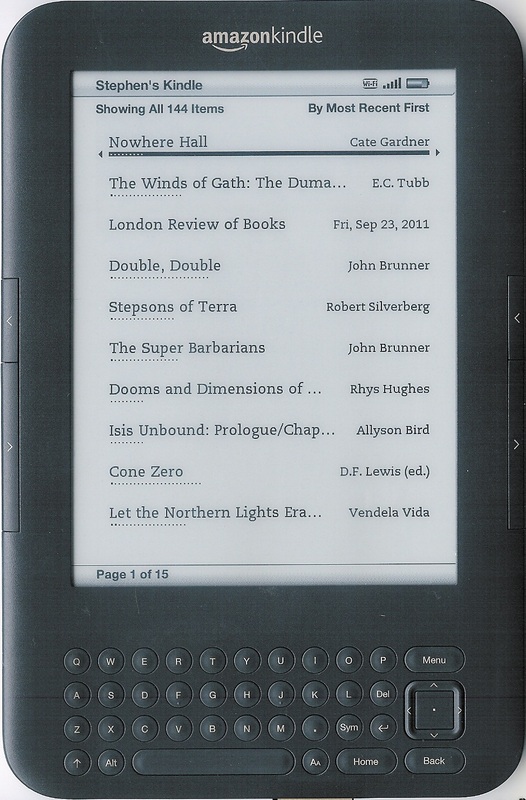 For example, a few weeks back I discovered a bunch of John Brunner books in the Kindle store I hadn't read before (e.g. The Super Barbarians, Manshape), and pre-ordered them – incidentally, the first Brunner books I've ever bought new instead of secondhand – and today I noticed that they're also reissuing all the Dumarest books (they're listed here on Amazon UK). Fantastic news, especially since there are lots of gaps between the dozen or so in the series I bought on eBay a couple of years ago, after hearing of the series for the first time in a Craig Herbertson article for Dark Horizons. If they're all as good as the one I've read, I think they'll do very well on Kindle. They're ideally suited to the format. I suspect other publishers may see the SF Gateway as a huge and rather worrying landgrab, but as a reader I love them for doing it. And so must the writers. I loved collecting secondhand books, but none of the money I spent on them ever went to the authors. I seem to remember reading that when John Brunner died, all his books were out of print. That shouldn't ever happen again to an author of that calibre. My top 100 most unread authors! Following my previous post analysing the list of books I’ve read, for some daft reason I thought it made sense to go on to look at those that I own, but haven’t read. My Goodreads list produces 1326 unread and unfinished books, not including those listed as to-read-for-review. Those books are by 628 different authors and editors, from A. Susan Williams (editor of The Penguin Book of Modern Fantasy by Women) to Zenna Henderson (author of The Anything Box). That Aldiss and Moorcock can show up in both my most read and most unread lists shows how amazingly productive they have been. You have to marvel at writers who can produce so much, of such consistently high quality. Patrick O’Brian is on there because I went nuts in a 3 for 2 sale and bought the complete Aubrey-Maturin, despite having read not a word of his fiction. Aside from The Wild Things, the Dave Eggers ones are all back issues of McSweeney’s. E.C. Tubb's presence is down to a bundle of Dumarest books on eBay a couple of years ago, although it turns out I still haven’t got around to reading Space 1999: Breakaway either. The Airs of Earth, A Rude Awakening, This World and Nearer Ones, The Year's Best SF 9, The Year's Best Science Fiction 1, Best Science Fiction Stories, Supertoys Last All Summer Long & Other Stories of Future Time, Perilous Planets, Life in the West, Cryptozoic!, The Primal Urge, Space, Time and Nathaniel, Last Orders and Other Stories, Intangibles Inc. and Other Stories, Cracken at Critical, Forgotten Life, The Dark Light Years , The Canopy of Time, Nebula Award Stories 2, The Year's Best Science Fiction 8, Comic Inferno, The Year's Best Science Fiction 7, A Soldier Erect, Starswarm, The Saliva Tree and Other Strange Growths, Galaxies Like Grains of Sand, The Malacia Tapestry, Hothouse, Helliconia Summer, Helliconia Winter, Non-Stop and Helliconia Spring. Must get stuck into those! If you haven’t yet lost the will to live, the rest of my top 100 unread and unfinished authors are below the jump break! 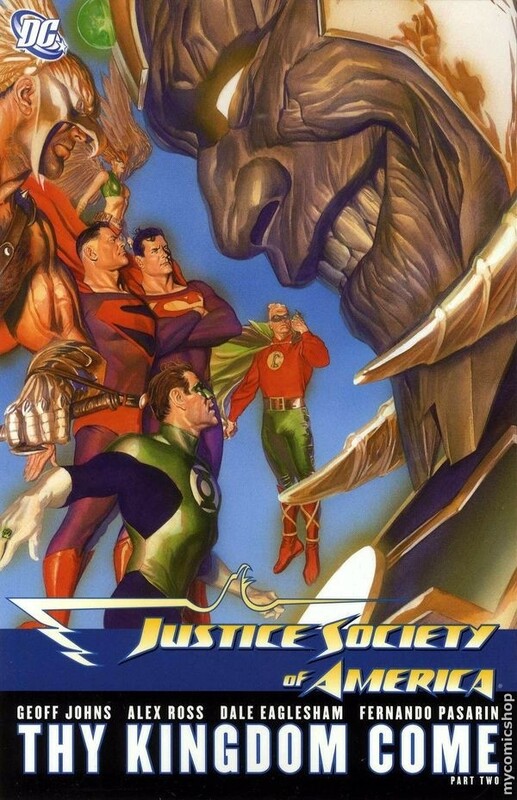 The brilliant thing about the JSA is that there always seems to be progression and continuity; this volume acts as a sequel and sort of a prequel to Kingdom Come. The Kingdom Come Superman has fled his world, the remaining superheroes having been killed in a nuclear blast, and is keen to prevent the events of Kingdom Come from happening in the current DC universe. (An incidental pleasure of the story is seeing an older Superman with the JSA again.) He knows that Gog was the progenitor of Magog, the anti-hero who caused so many problems in his reality, but the story has more twists than he expected. Kingdom Come artist Alex Ross is on board as co-writer, and provides some typically brilliant covers and flashback pages, but Geoff Johns writes, rather than Mark Waid. It's not a surprise that there's interest in mining the rich seam of Kingdom Come for further stories, and Waid produced his own sequel in The Kingdom, but this can't help but normalise its inspiration. It takes a myth and turns it into just another story. Would we want to see the Batman of The Dark Knight Returns time-travelling like this to the current DC Universe? This is a good story, but it lessens the original; whether the trade-off was worth it I won't know until reading the conclusion in the next book. 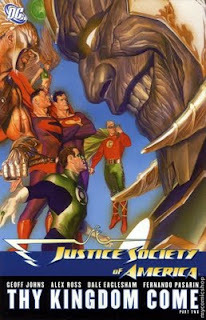 Justice Society of America: Thy Kingdom Come, Vol. 2, by Geoff Johns, Alex Ross, Dale Eaglesham, Fernando Pasarin, and Jerry Ordway. DC Comics, tpb, 192pp. Moorcock, Dicks, women - and statistics! A thrilling look through my Goodreads list. One thing I love about using Goodreads is that you can download your list of books as a spreadsheet. (Yes, this is going to get excitingly dull!) I’ve tried to make my Goodreads list as complete as possible; every so often I’ll turn up a few forgotten books, or notice some odd anomaly, but in general it gives a good picture of my reading. It includes fiction, non-fiction and books of comics (i.e. trade paperbacks and graphic novels), but not individual comic books. Anyway, I downloaded a copy of my booklist and had a play around with it... I seem to have read about 2439 books so far, so my average has been about 64 a year since birth. I own 1261 that I haven’t read, I’ve left 100 unfinished (mostly anthologies and omnibuses), and I’m currently reading 6. Narrowing the list down to the books I’ve read, I used the brilliant =UNIQUE function of Google Docs to produce a list of authors I’ve read. That information isn’t entirely reliable, in that the spreadsheet column I took the info from just lists the first listed author of each book. Also, using =COUNTIF to count how many books I’ve read by each of those authors, gives a total of 2302 books, so 137 books are getting mislaid somewhere. But never mind! Those 2302 books are by 755 different authors, so my average is about 3.05 books per author. 665 of the authors I've read are male, 84 are female, 6 are unknown. Of those 2302 books, 2146 are by male authors, 143 by women, 13 by unknown. So about 6.2% of the books I’ve read have been by women (very low, but actually a bit better than I’d expected), and 93% of the books I've read were by male authors. And on average I’ve read 3.23 books per male author (2146/665), but only 1.7 books per female author (143/84). Altogether I’ve read an amazing 423 books by those ten writers, accounting for a whopping 18.4% of my lifetime's reading. In fact, I've read more books by Moorcock, Dicks and Morrison (165) than by all the female writers of the world combined (143). That’s a list which hasn’t changed much, except in the order of the names, for 15 or 20 years. The first female writer to appear on the list would be Diana Wynne Jones, currently at 11th. There must be some books missing - I’m sure I’ve read more than two books by Marion Zimmer Bradley, and where is Vera Southgate? - but that’s the sorry picture as it stands. As you can see I’ve yet to finish the seventh Harry Potter book! The longest book I’ve read is Europe: a History by Norman Davies (1392pp), although I have to admit to browsing that one more than reading it from start to finish. The next longest was a comic, Bone: the One-Volume Edition (1332pp). The longest novel was Executive Decision by Tom Clancy (1296pp). Looking at the list by character, I’ve read about 189 Doctor Who titles, 52 about Superman, 48 Batman, 28 John Constantine, 23 Judge Dredd, 13 Star Wars, 11 Star Trek, 9 Conan. It’s odd to hear the Doctor talking about capitalism, TV addicts, unemployment and the dole, but then the third Doctor, star of this five-part story, always stood out from the rest. He’s joined here by the Brigadier and Sarah Jane Smith, and given that we lost both actors so recently it was lovely to hear Nicholas Courtney and Elisabeth Sladen performing with Jon Pertwee in what was to me a brand new adventure (it was originally broadcast on Radio 5 in 1993). The Doctor and UNIT, soon after the affair of the dinosaur invasion, investigate a new tourist attraction, Space World, which features alien animals and ER – not just virtual reality, but experienced reality (think the tapes in Strange Days). The action soon follows space stowaway Sarah Jane to Parakon, a world where hoity-toity types live the high life thanks to the miracle plant rapine. A kindly President (played by Maurice Denham!) is being manipulated, revolution is brewing, and of course the Doctor and his friends get stuck in. I wish I could say the story was as good as these beloved actors deserved. It wasn’t, quite, but that didn’t affect my enjoyment of it too much. Barry Letts’ script is notably waspish, seemingly full of bourgeois spite for both the effete upper classes – embarrassing new companion Jeremy Fitzoliver, for one – and the “lower lower class morons”. Episode two features one of the silliest resolutions to a cliffhanger this side of King of the Rocket Men: the Doctor simply jumps up from the autopsy table after being killed by a 200 foot fall. “Dead? Oh was I?” he asks. “Yes, well clearly I’m not now.” (Funny that the third and tenth Doctors could survive such falls, but not the fourth – put it down to entropy.) The sound effect that introduces the ER tapes is intensely irritating. But I can forgive a story a great deal if it puts the Doctor in a gladiatorial arena and the Brigadier at the head of a revolution. The overall effect is of a typical late Pertwee-era story given a Flash Gordon budget. This story comes in an excellent box set, Doctor Who: The BBC Radio Episodes, which contains another three Sarah Jane stories – The Pescatons, The Ghosts of N-Space and Exploration Earth – as well as Slipback, starring Colin Baker and Nicola Bryant, and Whatever Happened to... Susan? starring Jane Asher as the Doctor’s granddaughter. Doctor Who: The Paradise of Death, by Barry Letts, starring Jon Pertwee, Elisabeth Sladen and Nicholas Courtney. AudioGo, 2xCD, 2hrs25. Amazon UK. Amazon US . This review first appeared in the BFS Journal #3. Juliet McKenna: "Everyone can promote equality in genre writing"
"Every reviewer can check their personal choices of books, to make sure there’s balance. Each reviews editor can do the same; monthly, quarterly, annually. If balance is lacking, we can ask why without necessarily accusing anyone of sexism." At the time of writing (9 September 2011) the figure stands at 20.5%, so in theory at least 20.5% of my reviews would be of books by female writers and editors. I want to do a bit better than that, not least, as I've mentioned previously, because I'm unhappy with how few female writers have been appearing in the pages of our magazine. So far the Even Stephens approach I've adopted - alternating my reviews between books by men, books by women (excluding comics for now) - seems to be working well. Apart from anything else, it makes choosing my next book that little bit easier. It's interesting to note how it works against publishers who haven't published any books by women at all, and there are a few out there (for example...) - they're not in the running for half of my review slots. The title of this book might lead you to expect a collection of flash fiction or vampire stories, but it's neither, simply a collection of six short stories of average length. The introduction explains that there is no intentional theme, but there is perhaps an accidental one: the stories all seem to feature children, or parent-child relationships, in prominent roles; Pint-Sized Horror, you might say. The two best stories bookend the collection, smartly ensuring that the book gives a good first impression, and sends the reader away happy. They were also, for me, the two stories in which one sensed most strongly a character to the writing; one could almost imagine the rest being written by a single author, but not these. Reggie Oliver's "The Brighton Redemption" concerns the efforts to free from prison and reform a child murderer. 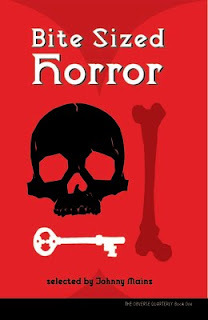 Like the other stories I've read (and seen performed) by this author, it is told in a very traditional style, but that's not a bad thing: the narrative is controlled, patient and politely horrific. With "The Carbon Heart" Conrad Williams ends the collection with style and purpose, the main character searching for a girl whose mother had died giving birth to her. In between is more of a mixed bag, although David Riley's zombie tale "His Pale Blue Eyes" is also good; as gripping - though also as solidly generic - as a typical episode of The Walking Dead. It features a little girl who is willing to make sacrifices to keep her parents alive. If one wonders why she doesn't take slightly less drastic measures to save them, that only adds to the horror of the story. Severely damaged people don't always behave in reasonable ways. “The Unquiet Bones” by Marie O'Regan was also unnerving, both for the strangeness of its best ideas - tiny bones or teeth sticking out from the walls to catch the unwary - and for a reason peculiar to this reader: the opening pages - in which a young couple take refuge in a spooky house - was almost precisely the same as a submission I’d once read for TQF. That says nothing about the story, and quite a bit about how reading submissions by the dozen can spoil you for short stories. This wasn't my favourite story from the collection, but I enjoyed it. In Paul Kane’s “The Between" a handful of people are trapped in a lift, and open it to find themselves suspended in darkness, and attacked by a flying shark monster. The lift lights continue to work, because it suits the story. The protagonist is an aggressive father struggling to get access to his son. Also in the lift is the lawyer for the other side, described as "the female lawyer". Though he followed her into the lift with the intention of harassing her, by the end she realises what a great guy he is, and earns herself a patronising kiss on the forehead. Johnny Mains also includes a story of his own, a risk for an editor; if the story isn't up to scratch, it brings the editor's judgment into question. However, the benefit for readers can be a bonus story, sometimes one which the editor has been able to acquire a little more easily than the others. "The Rookery", about a father and son who encounter a demonic crow-god-type-thing, isn't the strongest story here, but it certainly doesn't embarrass the others by its presence. I've given Obverse a rather rough time over proofreading in earlier reviews of their books, and this book is a bit better in that regard. There are a couple of clangers - including a character whose name changes from Sean to Shaun part-way through a story - and a handful of smaller mistakes, but nothing to put off potential subscribers to the quarterly. The three forthcoming titles in the series sound very interesting: Senor 105 and the Elements of Danger, The Diamond Lens and Other Stories, and Zenith Lives! Monsieur Zenith was one of the inspirations for Elric, and a contribution from Moorcock is apparently in hand! Subscribe here. Obverse Quarterly 1: Bite-Sized Horror, ed. by Johnny Mains. 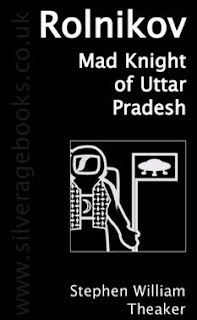 Obverse Books, pb, 92pp. Beware of possible bias: the reviewer worked with three of the contributors to this book on the British Fantasy Society committee. Having lost many friends in the battle to foil the daleks’ master plan, the first Doctor and Steven are rather pleased to find the Tardis has taken them to 1960s London. Plans to look up Ian and Barbara are interrupted by the sight of a mushroom-headed alien walking down the street. The trail leads to the City, where humans and disguised aliens are trading in a truly shocking commodity. 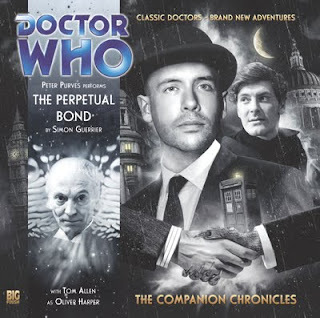 Like the other Companion Chronicles CDs, The Perpetual Bond falls midway between an audiobook and a play. Peter Purves narrates most of the story, and reads the dialogue of Steven and the Doctor, while Tom Allen narrates other sections and plays Oliver Harper, a shady sort with a good heart who seems likely to appear in future stories. Both acquit themselves well, but the story suffers from Doctor Who’s peculiar problem: a programme for children whose spin-offs are often aimed at adults. In this story that manifests itself in a setting and plot that’s rather dull for children, read in a way that seems patronising to an adult. That aside, I did enjoy it. It feels very true to that period of the show, and the first Doctor is very much in character, a twinkle in his eye, a naive sort of craftiness to his dealings with the villains. Its reflections on the relationship between a government and its people are very pertinent to the present day, while more positively it offers a time traveller’s view of how progress might be measured from one era to the next: more spectacles, more teeth, and so on. We tend to expect the future to be worse, but I think we’re all glad to not live in a time when diabetic children would simply die upon the disease’s onset. The two-episode structure works well. It avoids the need for too much superfluous action and lets the idea take centre stage. A very pleasant way to spend an hour. 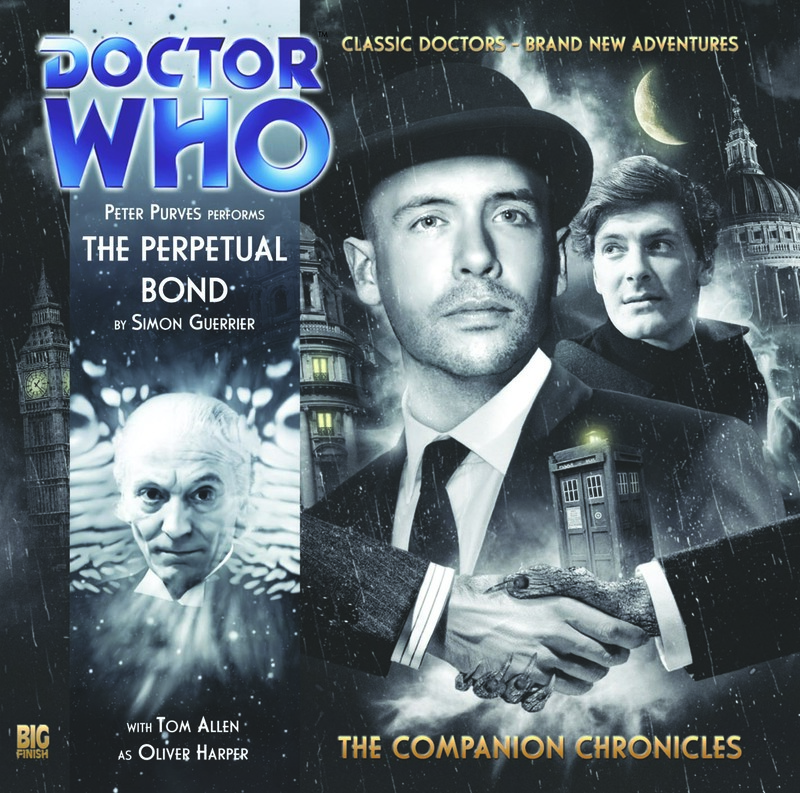 Doctor Who, The Companion Chronicles: The Perpetual Bond, by Simon Guerrier, read by Peter Purves and Tom Allen, Big Finish, 1xCD. This review originally appeared in BFS Journal #3. The book I never wrote - on sale for $321.73! Anyone who has had a book out knows that Amazon throws up interesting oddities - copies on sale in Japan for thousands of pounds, that kind of thing. Today, I was pleasantly surprised to see a paperback copy of Professor Challenger in Space, a book I self-published years ago, going for $321.73 here on Amazon! How pleasing for my vanity that someone thought it was worth that much, even if they were, sadly, quite mistaken. But what's this? The third in that series, Rolnikov, Mad Knight of Uttar Pradesh, also on sale, from the same vendor, for the same price! To say that was a surprise would be an understatement, given that I never actually wrote the book - it is a bibliographic ghost, registered with the ISBN Agency, but never published. So two things are clear. I need to write that book, else it'll haunt me for the rest of my life. Secondly, Mygrandmasgoodies is listing books for sale that he or she doesn't actually possess. I confess, I was half-tempted to order it. I bet it would have been by far the best of my novels. By the way, Professor Challenger in Space is available on Kindle for much less than $321.73 - $1.39 in the US, and 86p in the UK. Still overpriced, though! Envying your children doesn’t look good on a parent. My daughter has given five-star ratings to 37 books so far this year, while I've only done it once, with The Art of McSweeney's. I’ve slightly begrudged her the thrill of finding something new and wonderful in almost every single book she reads. At one point I began to wonder, was I losing the ability to be impressed to that extent by a book? Thank goodness for Ventriloquism, which makes it clear that if I want to be impressed, I’ve been reading the wrong books! All thirty-two of the stories in this collection surprised and challenged me with language, allusion and form, and gave me the unmistakable pleasure that comes from reading something I had never read before. The quality of the writing was extraordinary – for example, a demon’s “eyes do not burn, but in them are long staircases without end, turning and turning in blackness” – but I’m always attracted to ideas, and this book was bursting with them: a snowbound colony on the moon (“Oh, the Snow-Bound Earth, the Radiant Moon!”); a damned monk who has come to relish the visits of his tormentor (“Proverbs of Hell”); and the practical issues involved in unconventional solar expeditions (“How to Build a Ladder to the Sun in Six Simple Steps”), to pick a few. There are stories told by way of strips of film from an unfinished documentary (“The Radiant Car Thy Sparrows Drew”), in the course of a wine tasting (“Golubash (Wine-Blood-War-Elegy)”) and an auctioneer’s guide for bidders on a series of maps (“A Buyer's Guide to Maps of Antarctica”). It’s a book of which a reviewer might well be wary – a reviewer, in judging a book, is judged in return, and in the face of this book’s complexity and artistry I hardly felt up to scratch. I didn’t always understand the stories. “La Serenissima”, in which a nun discovers hidden messages; the strange city of “Palimpsest”; the “sea snail skull” of “Mother Is a Machine”: all left this reviewer baffled. Perhaps the review is slightly compromised by that failure on my part, but one day I will read a book, hear a story, see an episode of University Challenge that contains the vital clue, and the full pleasure of those stories will be unlocked – it was twenty-five years after reading The Voyage of the Dawn Treader that I clicked to its echoes of the Odyssey. Other readers, though, those who don’t need to write a review, certainly have nothing to fear. As with MST3K, if you miss one reference you’ll probably get the next one, and even if you don’t – if you are as ignorant as this reviewer of ancient myth and modern science – your enjoyment of the stories will hardly be lessened. 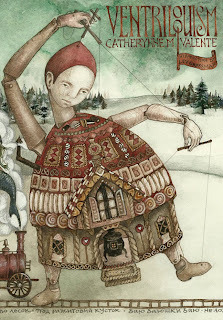 For example, one can appreciate “A Delicate Architecture” – which tells of a confectioner’s greatest achievement and his hopes that it might return him to the Emperor’s favour, and the consequences for his daughter – without noticing the light it reflects upon the story of Hansel and Gretel. Or in “Thread: A Triptych”, one can feel for the plight of immigrant wife Ariadne, trapped in an asylum for the insane, without grasping the significance of her description of her new-born son: “his cow-eyes blinked limpid up at me, and his hair was coarse as my dress, coarse as the tail of a bull”. And although there are several such reinterpretations of old stories, many stories are entirely new (so far as I know), such as “The City of Blind Delight”, where a railway station is made of interlinked human bodies; “The Anachronist's Cookbook”, in which a fifteen-year-old pickpocket plants revolutionary pamphlets in a steampunk Manchester; or “Killswitch”, about a computer game that deletes itself upon completion. Lev Grossman (whose The Magicians - reviewed here - is one of those odd books that has continued to grow on me since I read it) notes in his useful introduction, “If I had the stylistic range and the richness of invention Valente shows off in this one book, I would publish it in half a dozen slim volumes, over the course of 40 years, and call it a career.” These are the kind of stories many writers would sell a wicked stepmother to write, a brilliant blend of fine writing, super ideas and formal experimentation. It’s tempting to say that Valente makes it look easy, as she jumps from the science fiction of “How to Become a Mars Overlord” to the biblical fantasy of “A Dirge for Prester John”, from the zombies of “The Days of Flaming Motorcycles” to the pirate parrot horror of “The Ballad of the Sinister Mr. Mouth”, without ever touching the floor, but stories this rich in language and detail must surely be the product of a sustained creative effort, a great deal of work and thought – you really do have the sense that these are “six years of stories”, as she calls them in the acknowledgments. So, this time, I’m not envious of my daughter, I feel a bit sorry for her. She would love this book, its generous selection of female protagonists, heroes and villains, and its imaginative reinterpretations of fairy tales, legends, myths and monsters, but it’ll be ten years at least before she is old enough to enjoy it. As a reviewer, I somewhat regretted choosing such a challenging book, but as a reader I couldn’t have picked anything better. Playful experimentation with serious intent: what could be better? Ventriloquism, by Catherynne M. Valente. PS Publishing, hb, 352pp. Available direct from PS Publishing.